I don’t know of any kid who hasn’t wanted to own their own dinosaur. I mean, kids love giant extinct animals! I know, when I was a wee lad, that I loved learning all about dinosaurs and then discarding all that education to have them maul through squadrons of GI Joes on a Godzilla-like rampage. Of course, the king of the dinosaurs, Tyrannosaurus Rex, was always the favorite. 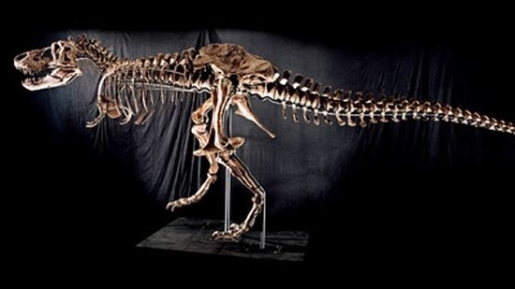 That’s why the skeleton of a T-Rex is going on sale at the Venetian Hotel and Casino in Las Vegas. Just think, if you have enough money, you can own a dinosaur! Granted, you have to get to the Venetian on October 3, 2009, for the auction, and you should probably have a spare £4.8 million handy, but if you meet those conditions, you can own Sampson. She’s 66 million years old, 15 feet tall, and 40 feet in length, making her one of the largest skeletons ever discovered. She was discovered in South Dakota in 1987, dug up in 1992, and now she can be yours if the price is right!